CSF recently completed our second course in the Himalayan region, Analysis of Infrastructure from a Conservation Economics Perspective Course. 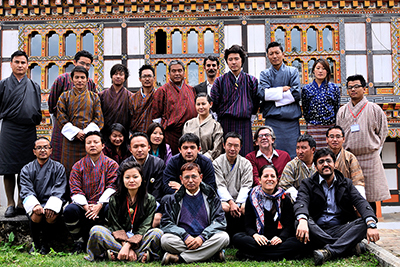 The course, held at the Ugyen Wangchuck Institute for Conservation and Environment (UWICE), was CSF's first to focus primarily on infrastructure development in the region from a conservation economics perspective. UWICE's beautiful campus located in the culture and biodiversity-rich Bumthang served as a great location for the 22 Himalayan-based participants to learn about economic tools for conservation and infrastructure planning. CSF partner and UWICE Director Nawang Norbu reported that he is looking forward for CSF’s next iteration of the course in the region. He has received positive feedback from course participants, who found the course meaningful and valuable for their work. University of Brasilia professor and long-time CSF instructor Jorge Madeira Nogueira presented the first module, which focused on microeconomics. From there, he transitioned to basic concepts of environmental economics, environmental policy, valuation, and capital theory. Participants enjoyed his classes, dynamic teaching style, and not a single hour passed by without Jorge making the class laugh with his practical examples of infrastructure decision-making, the market failures we all have to endure throughout our lives, and how useful it would be for bird lovers and road lovers to talk to each other. For the next few days, Cambridge Resource International Inc. (CRI) cost-benefit specialist Mikhail Miklyaev taught participants cost-benefit analysis concepts and techniques. Students indicated that they found both his lectures and practical sessions extremely useful. During this module participants were able to understand how to calculate and rank investments using different investment criteria. For the last two days of the course, participants were given a case to solve: CSF’s signature exercise: Asante Dam II. Professor Ngawang Dendup, a participant from South Asian Network for Development and Environmental Economics (SANDEE) and Sherubtse College, reported that students stayed late discussing the implications and potential solutions to the case. Through the Asante Dam group presentations, it became clear that the group had learned new tools and improved their knowledge of environmental economics and cost-benefit analysis. Once the presentations were completed and feedback was provided to participants, the last module on real dam and road cost-benefit analysis in the Himalayas and across the world was delivered by Mikhail and CSF’s Irene Burgués. The course ended with a key question from Chencho Dukpa, Chief researcher at the Ministry of Agriculture and Forests in Bhutan. “Was decision-making improved through the analyses presented?” Irene explained that some of the analyses presented did improve decision making, but as a component of different activities and efforts. This course was made possible through support from the Gordon and Betty Moore Foundation, the Bhutan Foundation, UWICE, and by the support of the American People through the United States Agency for International Development (USAID). This course became a reality through important coordination, fundraising and hospitality efforts by UWICE’s Nawang Norbu and Namgay Dema. Thanks also to Jorge Madeira Nogueira and CRI’s Glenn Jenkins, Bahman Kashi and Mikhail Miklyaev, who made important efforts to ensure course materials were appropriate and useful for participants. Photo credits: Satya Priya Gautam Bhalla. © 2014 All Rights Reserved.